Happy Pongal/Sankranti ! While going through my blog, I realized that I had lot of sweet/sakkarai pongal recipes but not one ven pongal ( savory ), so decided to post this today. 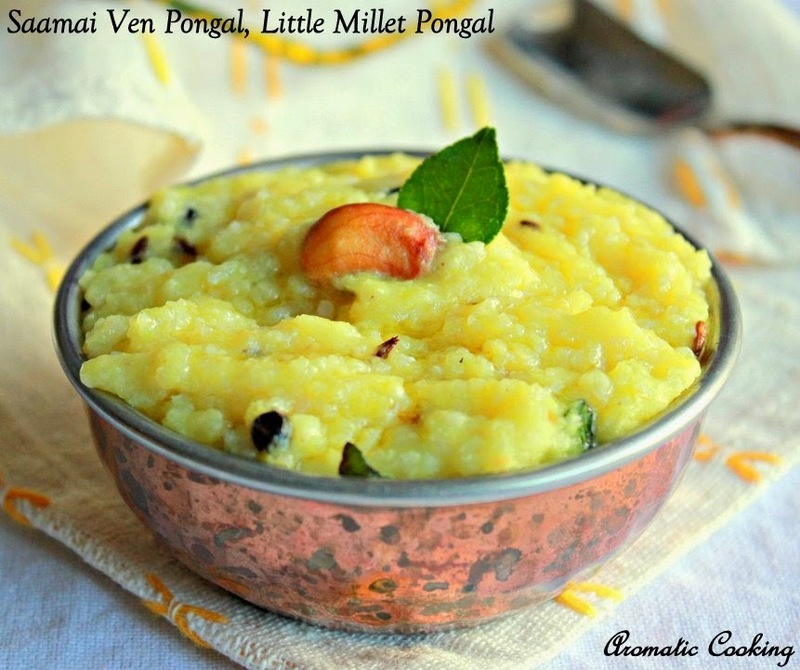 But instead of using rice I have used millets, I have used saamai/ small millet for making this pongal. It's a very easy recipe, it came out really good and tasted as good as the regular pongal..
Dry roast the little millet and moong dal till you get a nice aroma. Wash it and cook it with about 21/2 cups of water and 1/2 teaspoon of oil till done. Heat some oil and ghee mixture, add the cumin seeds, black pepper and cashews. Once the cumin seeds start sizzling and the cashew start turning golden, add the ginger, curry leaves, asafoetida and turmeric powder and mix it for a 1/2 a minute. Add it to the cooked millet and moong dal and mix it well. Serve it warm with chutney and sambar. I cooked the millets and dal in the pressure pan, you can do it in a regular pan too. The millet and dal once cooked, shouldn't be dry, add some water, it should be in a porridge consistency, it thickens as it cools. Be a little liberal with the ghee and don't avoid the ginger. 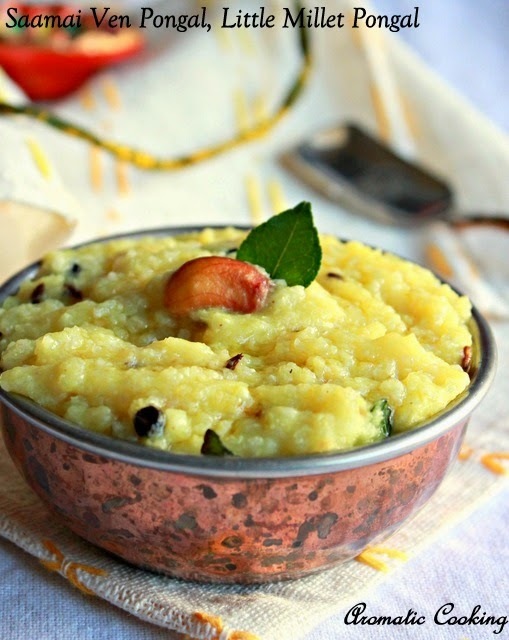 Happy pongal to u hema..This pongal look so delicious. A superb item. I am actually very fond of Pongal but did not have millet pongal yet. Will surely prepare as per your recipe and will share the feedback with u. Thank u for the tempting share...Keep posting with lots more.